Pain is the most common reason people seek health care. A common treatment for moderate to severe acute and chronic pain has including opioids. While many patients may suffer from an opioid use disorder that started with experimentation with illicit opioids or heroin, most patients with an opioid use disorder started with prescribed opioids. For the past two decades, pain has been identified as the 5th vital sign and efforts to assess for and treat pain has become a standard of practice in health care. Pharmaceutical manufacturers of opioids encourage the use of their products and minimize the addictive potential when used to manage pain. Over prescribing and lack of close follow-up soon led to physical dependence on opioids, poor pain management, and a tolerance to the effects requiring patients to seek higher and higher doses. Currently, the CDC has estimated 91 opioid overdoses per day in the U.S.(https://www.cdc.gov/drugoverdose/epidemic/index.html). This is a complex problem with various contributing factors, and all potential treatments should be explored. www.cdc.gov/mmwr/volumes/65/rr/rr6501e1.htm). Health care practitioners are strongly encouraged to use these guidelines for managing their patients with non-cancer related chronic pain. While cannabis remains in Schedule I (forbidden category) of the Controlled Substances, countless patients are seeking cannabis information or a safe supply of the medicine based on word of mouth from other patients. While we now have 28 states with medical “marijuana” laws, each law varies from state to state, but all include barriers to patient access, including ignorant, indifferent or intimidated health care providers. As a nurse, what do you know about the cannabis plant or cannabis/cannabinoid products? What do you know about the use of cannabis for pain management? How does it work? Is it safe? Is it legal? Why should I care? These are questions that nurses are expected to be able to answer. We are the most trusted group of professionals, we are the largest health care discipline at 3.6 million RNs strong, and we spend the most time with patients. This is an ethical responsibility as a patient advocate. Cannabis has been used for millennia and various records note its use as an analgesic, muscle relaxant, anti-inflammatory and useful in the management of pain, especially chronic neuropathic pain. Cannabis is a plant that contains more than 400 constituents including cannabinoids (such as THC and CBD), as well as terpenes and flavonoids. These cannabinoids and some of the terpenes have been found to possess analgesic, anti-inflammatory, and muscle relaxant properties. When used as a whole plant herbal medicine, there is synergy among these constituents that produce a more effective and gentle effect, than if single constituents from the plant are used. In a 1914 Blumgarten pharmacology text for nurses, it states in bold that cannabis “relieves pain and induces sleep.” Modern research on the interaction between opioids and THC shows a synergistic effect, and when using cannabis as an adjunct to prescribed opioids, the development of tolerance to opioids is decreased (Cichewicz et al. 1999, Cichewicz&McCarthey, 2003). But the more compelling rationale for the clinical use of cannabis for pain management is the discovery and increasing understanding of the Endocannabinoid System (eCS). The primary role of the ECS is to protect us from stressors and help keep us in balance. This system plays an important role in decreasing the harm from an injury, aiding in the healing process, as well as decreasing the perception of pain. Cannabis is remarkably a nontoxic botanical medicine. That’s not to say it is completely safe, but it is less addictive and less toxic than opioids. When cannabis is used as an adjunct pain medication, many patients can decrease their opioid dose or eliminate opioids. Cannabis clinicians are seeing this trend in their chronic pain patients, and this has been validated with a study of patients in an Israeli nursing home (Weisberg &Sikorin, 2015). With the passage of medical cannabis state laws, patients are speaking more openly about their use and clinicians and researchers are seeing results. In 2011 Donald Abrams, M.D. conducted a study on 21 patients who were on sustained release oxycodone or morphine, and they added vaporized cannabis to the patients’ treatment protocols, they found a lower plasma level of the opioids, but a statistically significant reduction in pain. A 6-month follow-up study of 176 patients using cannabis for pain management found improved pain management and functional outcomes along with a 44% reduction in the use of opioids (Haroutounian et al., 2016). A retrospective survey of 244 chronic pain patients at a cannabis dispensary in Michigan found a 64% lower opioid use, an increased quality of life, and fewer medication side effects along with fewer medications used by these patients once they began using cannabis for pain management (Boehnke et al., 2016). Bachhuber and others looked at states’ death certificate data from 1999-2010 comparing the medical cannabis states to states without laws allowing the medicinal use of the plant. They found a 24.8% decreased mortality rate from opioids in the 23 medical cannabis states compared to the other states and that there was a progressive decrease in the states that had a cannabis law in effect for longer periods of time (2014). While that simply shows an association, it is a striking finding that supports the anecdotal reports. Cannabis inappropriately remains in Schedule I (the forbidden category) of the Controlled Substances despite the clear evidence that it does not meet the criteria for such placement: not safe for medical use, no currently accepted medical use in treatment in the United States, and highly addictive. There has never been an overdose from cannabis. Opioids such as oxycontin, Dilaudid, morphine or fentanyl are in Schedule II – highly addictive, but recognized as being safe to use as prescribed and having medical value. As noted above, there are now 91 opioid overdoses per day. The prohibition of the cannabis plant is a literally a crime, when one realizes that the use of cannabis in chronic pain patients can not only provide better management of chronic pain and an increased quality of life, but it can significantly decrease the amount of opioids a person uses and save lives. As nurses, we cannot turn our backs on these patients. 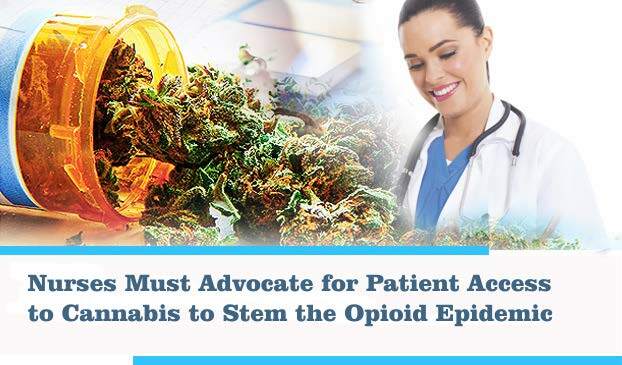 We need to educate our colleagues and patients about the use of cannabis for the management of chronic pain. We need to talk with our legislators and urge them to decrease roadblocks on the state level and end the prohibition of cannabis on the federal level. Cannabis should be removed completely from the Controlled Substances listing and patients should be allowed to grow this wonderful natural plant. Once the cannabis plant is recognized as a medicinal herb, quality control measures can and should be applied to cannabis products using guidelines set by the herbal medicine experts. Abrams, DI, Couey P, Shade SB, Kelly ME, Benowitz NL. (2011). Cannabinoid-opioid interaction in chronic pain.Clinical Pharmacology & Therapeutics. 90(6):844-851. Bachhuber MA, Bachhuber MA, Bachhuber MA, Saloner B, Barry CL, Saloner B., Cunningham CO & Barry CL. (2014). Medical cannabis laws and opioid analgesic overdose mortality in the United States, 1999-2010. JAMA Internal Medicine. 17(10):1668-1673. Blumgarten, A.S. (1914). MateriaMedica for Nurses. The MacMillan Company: NY. Boehnke KF, Litinas E &Clauw DJ. (2016). Medical cannabis use is associated with decreased opiate medication use in a retrospective cross-sectional survey of patients with chronic pain. Journal of Pain. Cichewicz DL, Martin ZL, Smith FL, et al. 1999. Enhancement of mu opioid antinociception by oral delta9-tetrahydrocannabinol: Dose-response analysis and receptor identification. J PharmacolExpTher, 289:859–67. Haroutounian S, Ratz Y, Saifi F., Meidan R & Davidson E. (2016) The effect of medicinal cannabis on pain and quality-of-life outcomes in chronic pain: A prospective open-label study. Clinical Journal of Pain. Weisberg, M &Sikorin, I. (2015). TikunOlam Medical Cannabis Treatment Center: A Nurse-led Approach. Presented on May 23, 2015, at The Ninth National Clinical Conference on Cannabis Therapeutics in West Palm Beach, FL.